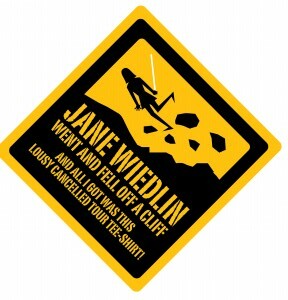 WAIST HIGH: Jane Wiedlin Went And Fell Off A Cliff. Jane Wiedlin Went And Fell Off A Cliff. After the Go-Go's were forced to cancel their three-week North American summer tour Happily Ever After following guitarist Jane Wiedlin's injury while hiking near her California home, Jane tweeted about how she thought the t-shirt designed by a fan (via a contest) that was to be included in the official tour merchandise should say "Jane Wiedlin went and fell off a cliff and all I got was this lousy cancelled tour tee-shirt!" Alas, a t-shirt has been born. In response to Jane's tweet, "Kelly Lawrence (of Thinking Cap Design) posted a hilarious design on Jane's Facebook page and we here at Team Wiedlin loved the design so much we decided to make T-shirts!!" Buy your shirt HERE. 100% of the profits from the shirt will be going to Rocket Dog Rescue. Jane posted June 14 at janewiedlin.com: "...I'm sorry the tour got canceled…damn cliff messin' up our plans! Though I cannot predict the future, my dream is that we will re-schedule the tour eventually, and we can have the contest then! In the meantime, I hope you will send me good vibes for a speedy recovery from my surgery."